For me, Anne Curtis is truly a fashionista. It seems she can pull off whatever color of the gown she is wearing. 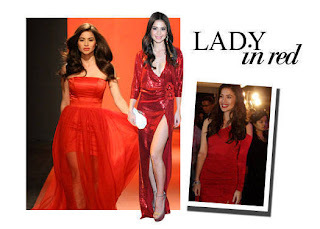 After seeing her in these lovely red gowns, I now understand why my daughter also chose red for her prom night gown. ^_^ After her very successful concert and aside from her daily show "It's Showtime!" I wonder what's the next TV or movie project for Anne Curtis? Now it's Toni Gonzaga's turn to be featured here with wedding gowns from some of her movies. There's "My Amnesia Girl" which paired her with John Lloyd Cruz. "Ang Tanging Pamilya" brought back the Toni Gonzaga-Sam Milby love team, that I also like. And then there's the "Wedding Tayo, Wedding Hindi" movie with comedienne Eugene Domingo where Toni was paired with Zanjoe Marudo. I don't exactly fancy watching TV Reality Shows such as the Pinoy version of Big Brother. 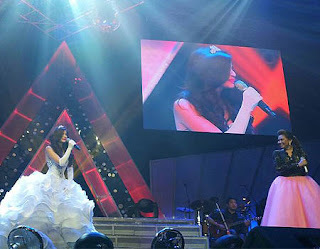 But I do know that Toni Gonzaga and Bianca Gonzales are doing such great job as hosts of the show. Plus, I do know that both ladies usually wear lovely gowns during special nights like eviction nights and other specials. I do take a look at what Toni and Bianca wear as I usually love their looks on the show. Toni looks lovely in pink and I love that white gown on Bianca. Dreams do come true. Well at least they did for Anne Curtis. She staged a successful concert at the Smart Araneta Coliseum last January 28th. Wow! To think that one cannot really consider Anne a great singer.. but you must admit she's pretty much a performer! The rest of the pics showed how much fun the concert was. Iza Calzado Is Now A Kapamilya Artist!